The Town of Maggie Valley’s Wastewater Treatment Plant (WWTP) is a 1.0 million gallon per day (MGD) extended aeration secondary treatment plant serving Maggie Valley and the Jonathan Valley area. Orginally built in 1986 the plant has been upgraded three times, most recently in 2006. The WWTP services approximately 1,850 unique sewer customers with a combined customer population of approximately 4,255. In 2015 the facility treated an average daily flow of 321,000 gallons per day. The plant consists of a step bar-screen with shaftless screw conveyor for preliminary treatment. Two – first stage and two – second stage aeration basins along with a rectangular clarifier for secondary treatment. Disinfection is done by injecting chlorine into the effluent and dechlorination is achieved with sulphur dioxide gas injection. Residuals are held in two 60,000 gallon aerobic digesters until dewatering is completed by a one meter belt filter press. Dewatered sludge is then stabilized by using the N-VIRO Alkaline Stabilization Process. The WWTP produces approximately 300 tons per year of Class A stabilized sludge for distribution and use by the public. The Town of Maggie Valley’s service area covers approximately 15 square miles. The Town provides service to areas along Jonathan Valley from Fie Top Road to Interstate 40. There are over 45 miles of public sanitary gravity sewer line, one public pump station within the collection system and approximately 1,170 manholes system wide that are located in public streets, right-of-ways and on easements. There is another four miles of private sewer system that drains to the Town’s public collection system. The Town’s collection system is considered young as the majority of the lines were completed in 1986. Pipe sizes throughout the collection system range from 4 inches to 18 inches with the majority (38 miles) being larger pipes 8 inches to 18 inches in size. Pipe materials used within the system include both polyvinyl chloride (PVC) and ductile iron pipe (DIP) with the majority being PVC. The Town complies with our collection system permit by inspecting our entire system annually and cleaning 10 percent of the main lines as required by North Carolina law. The Town of Maggie Valley System Performance Annual Report for 2018 may be viewed here. When a stoppage occurs, the Town will assess it to determine if the blockage is on the Town’s side of the sewer line or the homeowner’s side of the sewer line. The Town maintains all major sewer mains and manholes throughout Maggie Valley. Homeowners and businesses own the plumbing lines that connect to the sewer main. The plumbing line is often referred to as a private sewer lateral. The Town will clear blockages that occur in the main sewer line or in the sewer lateral, from the main line to the clean out pipe at the edge of the property. The sewer clean out is a vertical, capped 4″ pipe that provides direct access to the sewer system. Homeowners are responsible for blockages that occur in the sewer lateral, located between the clean out pipe and the dwelling. If there is no clean out pipe at the edge of the property, the homeowner is responsible for blockages that occur anywhere in the sewer lateral. The North Carolina Building Code requires a backwater valve to be installed if the plumbing fixtures are below the top of the first, upstream manhole on the street. A properly operating backwater valve allows flow to go only in one direction, thus preventing wastewater from entering your building during regular sewer system maintenance or inadvertent sewer system backups. To find out if you have or need a backwater valve, check your plumbing plans or consult with your builder or professional plumber. If sewage backs up into your home, the cost to repair damages and clean up may be high, and is the responsibility of the owner when a backwater valve has not been installed by the property owner. For more information, call the Town Hall at 828/926-0866. An easement is a legal interest in property for a specific purpose, such as giving a company access to run a telephone line underground. Utility easements that are dedicated to the Town of Maggie Valley cover water and/or sanitary sewer lines, and are typically 20 feet wide. All easements and rights-of-way are indicated on property surveys. Homeowners are urged to check their property surveys before adding fences or plants to ensure easements and rights-of-way are kept clear. After the easement is granted, the property owner continues to maintain the easement just like the rest of the yard. While fences and landscaping improvements may be installed withing the easement, please note that these are subject to disturbance or damage during the Town’s use of the easement and may be removed if the Town needs access for maintenance or utility line repair. North Carolina law requires utilities to perform annual inspections of all easements to ensure proper access for maintenance activities. The Town performs these inspections on an annual and bi-annual schedule. Inspections include, but are not limited to, the observation of manholes, examination of easements’ condition for mowing and access, and the identification of items such as planted trees, bushes and fences that may obstruct access for routine maintenance. To protect our public health and environment, the Town of Maggie Valley periodically clears easements of trees and re-growth to prevent root penetration into sewer lines, which cause sewer blockages and sewer overflows. Fences without removable sections or gates within the sanitary sewer easements are subject to disturbance and/or damage during easement maintenance. The Town will not replace those items back onto the Town’s easement and is not responsible for any damage that may occur. A Town employee is on site at all times during the easement mowing or clearing to monitor progress and address any citizen concerns. Easement mowing is done by the Town’s Public Works Staff. Typical easements are 20 feet wide, but in most cases the easements will not be cut to full width. Selective vegetation will only be removed where access is needed for routine maintenance or where sewer line segments have been problem areas. These areas can consist of tree roots that have damaged the utility lines and caused environmental damage resulting from sewer overflows. The Town of Maggie Valley performs “smoke testing” within our sewer system to to help locate areas where storm water and other surface waters are entering the system and reveal sources of sewer odors. These smoke tests are conducted using non-toxic smoke at applied to different locations throughout town. If we are testing in your area, you will receive a 24-hour notice on the door of your home or business prior to the test date. Most residents and business owners will not see or smell the smoke used during our test. 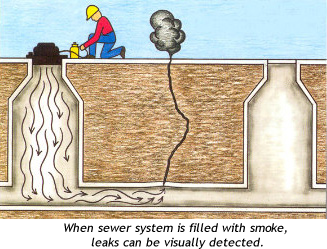 If traces of the smoke or its odor do enter your building, it is an indication that gasses and odors from the sewer may also be entering at other times. Report the presence of smoke in your building during testing by calling (828) 926-0866. We recommend that you locate and correct the issue allowing smoke to enter your structure. While we’ll render all possible assistance, the correction of any defects on private property is the sole responsibility of the property owner. When poured down the drain, FOG can build up in pipes and equipment and cause significant problems in the sewer system and wastewater treatment plants. Problems such as sewer line blockages that cause sewer overflows are the result of improper disposal of FOG. Sewer overflows cause environmental health hazards and property damage and lead to increased operation and maintenance costs which show up as higher sewer bills for you the customer. FOG that reaches the wastewater treatment plant affects the Biological Nutrient Removal process, increases Biological Oxygen Demand, and increases maintenance for removal. Residential households contribute FOG build-up in the sewer lines when grease is washed into the plumbing system, usually through the kitchen sink. FOG build-up must be physically removed from sewer lines by Town of Maggie Valley Public Works Department Staff. This requires expensive equipment and is a time consuming process. FOG does not always wait until it gets to the city sewer lines before it starts accumulating on pipes. It can be a major contributor to many blockages in private sewer lines. When a blockage occurs within your plumbing system, you are responsible for removing the blockage. Doing so can range from inconvenient and unpleasant to quite expensive if a plumber’s service is required. It’s okay to pour grease down the drain as long as… I use the garbage disposal. It’s okay to pour grease down the drain as long as… … I run hot water. It’s okay to pour grease down the drain as long as… I chase it down with a dose of dish soap. 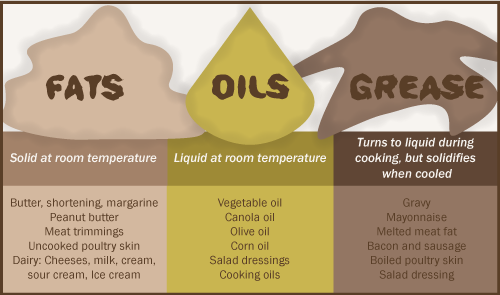 It’s okay to pour grease down the drain as long as… it is a liquid oil at room temperature. Never pour grease, fats, or oil down the drain or garbage disposal. Pour FOG into jars, cans, and plastic tubs (Careful, the liquid may be hot!) Let contents cool and solidify. When the container is full, throw away with your trash. Used cooking oil can be taken to the Haywood County Recycling Center in sealed containers no larger than five gallons. For greasy pans, pour off the grease into a container as mentioned above, then use a paper towel to wipe out the remaining grease in the pan prior to washing. Scrape as much of food scraps and residue as possible from plates and cooking utensils into the garbage. A silicon scraper or spatula works great! Is the grease trap I have adequate? That depends on the discharge flow from the establishment and the amount of grease contained in the wastewater that discharges into the trap. The Universal Plumbing Code states that no grease trap should have a capacity less than 20 gallons per minute or more than 55 gallons per minute. Internal traps will need to be assessed based on the number of water generated fixtures it serves. The amount of grease in the wastewater can impact whether or not the establishment grease trap is able prevent grease from being discharged into the collection system. The FSE may need to implement Best Management Practices (BMP) in managing the handling of fats, oils and grease. I don’t know if I have a grease trap? The first step is can you identify any under-the-counter containers where sinks and drains tie into? Check the plumbing drawing of the facility if available, to see if a grease trap is identified on the drawing. If you are still unsure you may wish to contact a plumber to assist you in tracing the discharge lines from the facility to see if they lead to a grease trap. Typically outside traps have manhole covers (some only one but typically two). Outside grease traps are typically close to the kitchen section of the facility. What if I don’t have grease trap? If your FSE discharges fats, oils and greases and does not have a grease trap eventually maintenance problems will occur with clogged sewer lines in the facility or backup situations in the wastewater collection lines in your service area. If you establishment is found to be the cause of such problems within the sewer service area based on the Town of Maggie Valley Sewer Use Ordinance, your establishment may be charged for any cost recovery associated with the maintenance and repair for any issues associated with the grease discharges. To prevent this the Town of Maggie Valley requires all FSEs to install some type of grease control device. This could be an in-ground outside trap or an approved under-the-counter unit(s). If there is no grease trap at the FSE, Town of Maggie Valley requires that all grease laden waste streams be tied into grease control device. The Town of Maggie Valley requires in-ground outside grease traps be no less than 1000 gallons. A guide sheet for sizing the grease trap is located in the Grease Control Program for your assistance. The FSE may want to utilize an engineer to assist with determining the proper size your FSE needs. Where it is determined by the Town that the installation of an approved in-ground outside grease trap is infeasible or physically impossible to install, then an adequate and approved under-the-counter grease trap may be required for use on individual fixtures including sinks, dishwashers, and other potentially grease containing drains. The location of these units must be located as near as possible to the source of the wastewater. Under-the-counter grease traps require more frequent maintenance and record-keeping. Who is responsible for inspecting my grease trap? The ultimate responsibility for inspecting your grease trap is the owner/user of the establishment. Town of Maggie Valley personnel perform routine inspections on all known in-ground outside grease traps and under–the-counter grease traps within its sewer service area. These inspections do not alleviate the owner/user of the establishment from the responsibility of inspecting or ensuring the FSE’s grease trap is operating and compliant. What if my grease trap is found to be noncompliant by Town of Maggie Valley Sewer Inspector? If the inspector finds that the grease trap is noncompliant, a notice of noncompliance will be left with the establishment. The notice will list the name of the establishment, the date and a deadline date for the noncompliant item(s) to be corrected. A typical notice requires that the owner/user list the name of the hauler, the date pumped, and where the grease pumped was hauled. This form should be completed and returned to Town of Maggie Valley. If the form is not returned, the establishment will be listed on a past due listing maintained by the Town of Maggie Valley; the past due listing may result in Town of Maggie Valley performing additional inspections to check compliance. 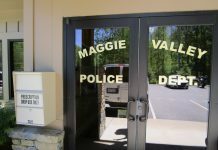 If the establishment is found not to have complied with the notice of noncompliance, the Town of Maggie Valley may escalate enforcement. Escalated enforcement is taken against an FSE that does not comply with the requirements found in the Town of Maggie Valley Fats, Oils and Grease Control Program and/or does not comply with the requirements listed on the notice of noncompliance left by the Town of Maggie Valley Sewer Utility Inspector. Escalated enforcement can result in a civil penalty not exceeding $2000.00 per day of noncompliance. A civil penalty may be issued by Town of Maggie Valley for failure to comply and this failure shall be documented along with the assessed penalty with a deadline for payment unless otherwise documented.